The people behind a plan to launch winged, wind-assisted ferries on San Francisco Bay have already carried thousands of passengers under sail. 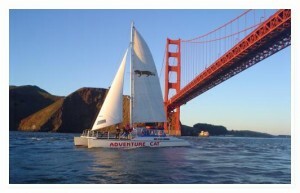 That would be Jay Gardner, Pam Simonson, and Hans Korfin of Adventure Cat Sailing Charters. They presented their winged-ferry concept last week to officials at Golden Gate Transit. I figure it’s an idea whose time has come. With San Francisco Bay’s seasonally-reliable winds, it would be possible for such a ferry to cover certain routes at certain times entirely under wind power. For the sake of maintaining schedules, however, the proposed new ferries will have propulsion, and for the sake of keeping everybody calm, we’ll be calling them “wind-assisted” for a projected forty percent reduction in fuel cost and emissions. Not to mention, they would become an iconic focal point of San Francisco Bay. “If Auckland is the City of Sails, San Francisco could be the City of Wings,” Gardner said. 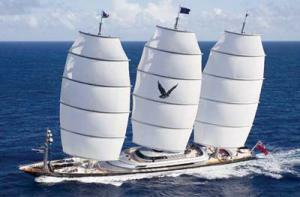 With wing-powered America’s Cup boats coming to the bay, we’re halfway there already. There is nothing far-fetched about this. And although it’s not a fact that the mainstream press will recognize, Wind + Wing Technologies has highly credible partners, including the forefront design and engineering firm of Morrelli & Melvin, which has been involved since 2008. In regard to conveying the message, however, it was impossible to not be amused at a bylined news account in the San Francisco Examiner, which wrote about the project and the “swirling bay winds” and accompanied it with an odd photograph . . . Which prompted a call from a certain blogger’s wife asking, in larger words, WTF? I’m pretty sure every sailor who saw the article recognized SV Maltese Falcon, the 288-footer that Tom Perkins sold a while back but which will always be known as The-boat-that-Tom-Perkins-sold-but-will-always-be-known-as-Tom-Perkins’-boat. It is not a catamaran. It is not a ferry. But except for that, I suppose I’m being picky. Talk about the risks of sharing sailing with the unwashed. This is a concept for a 149-passenger 90-footer, says Gardner: “It’s low-profile, low windage.” And the concept is intended to be scalable. What I see missing in this concept, though, screamingly missing—and Gardner sees it, so I’m not being original—is access to the bow. Sure, the regular commuters will soon grow indifferent, but this is one icon you can’t pay off without letting the adventurous souls among your passengers get out and breathe fresh air. For many ferry-riding visitors, getting out there, feeling the wind and the waves would wind up being the most vivid memory of a visit to San Francisco, beyond the cable cars and far beyond the wax museum. I’m seeing a ferry that can become a destination-sensation. Notice, kinda like I believed the America’s Cup would come to San Francisco, I’m believing in winged ferries. Because it ought to happen. 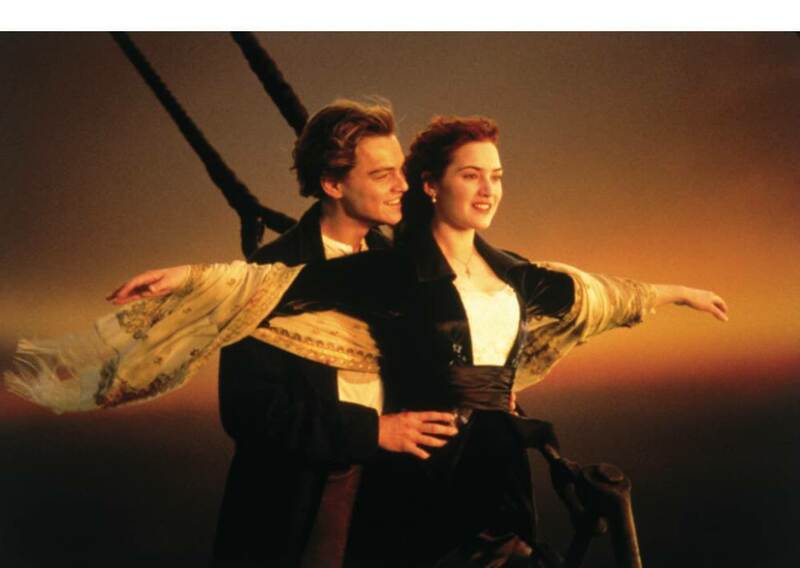 This is how I see the bow of that ferry, when a couple of young out of towners drop in . . .
Let’s note, further, that it would be a reach-out, reach-back between Fisherman’s Wharf and Alcatraz for the commercial operators who carry tourists out to “The Rock.” I figure that’s even more ideal for sail, considering the bias toward reach-reach and the bias toward a summertime (seabreeze) timeframe.I will share with you that, about a year ago, when Jay Gardner did a presentation on this subject at a Wednesday Yachting Lunch program of the St. Francis Yacht Club (programs that are open to members of all recognized yacht clubs), there were leaders of commercial ferry companies who came to meet and listen. Golden Gate Transit is part of the regional government, a division of the Golden Gate Bridge, Highway and Transportation District. It operates routes between the San Francisco Ferry Building at the foot of Market Street, and the towns of Sausalito and Larkspur. It also runs between Sausalito and Larkspur to AT&T Park for Giants baseball games. For a region that is a global leader in green technologies, wind-assisted ferries is an idea that deserves to become a cause. 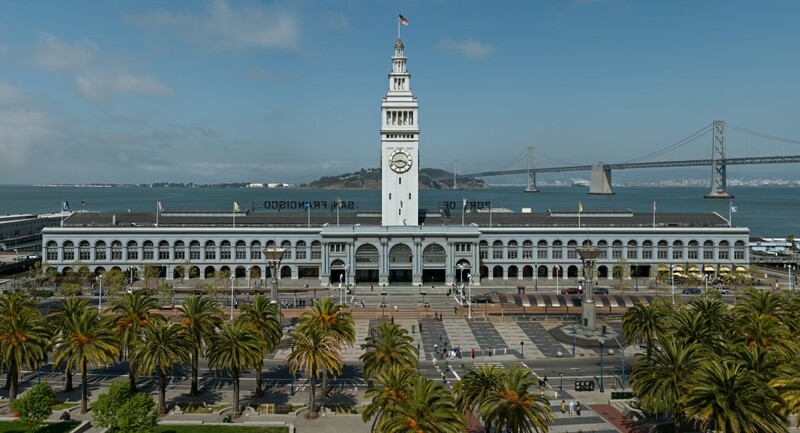 The Ferry Building . . .
Now, maybe the concept fails. I doubt that, but we have to agree that we’re talking theory at this point, and the next thing is a proof-of-concept test. Which brings us to Plan A, which also is (“at this point”) only partly funded. In Honolulu, Hawaii, Harbor Wing Technologies has put years into developing a wing-powered, remotely-operated surveillance vehicle that has attracted the attention of the United States Navy, the world’s largest consumer of fossil fuels. 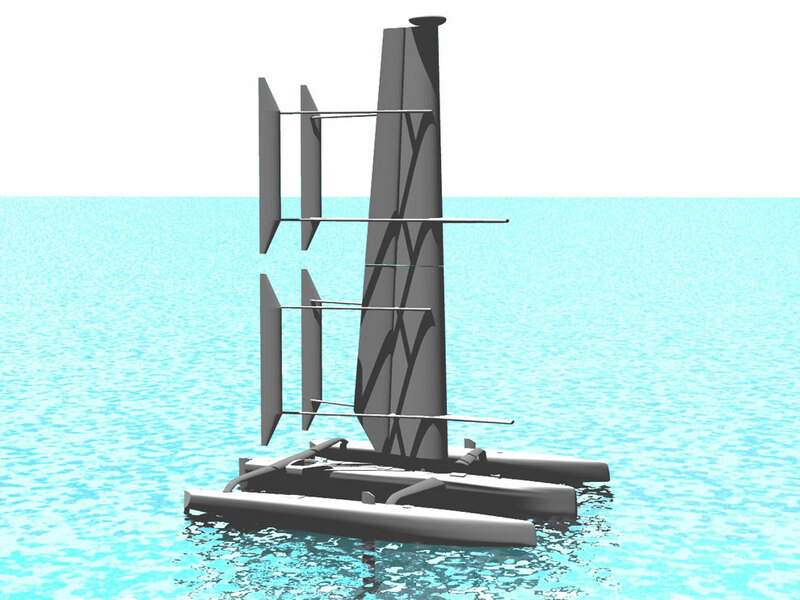 The test vehicle consists of a trimaran body with a computer-controlled wing. For a remotely-operated boat, computer control is the only option (with appropriate redundancy, of course). We’ve written about this before, right here. Harbor Wing’s latest test boat, a wing on a Contour 50 platform, will be available for a test program on San Francisco Bay in 2012. The wing rendered below is calculated to develop 2,200 tons of thrust, Gardner said . . . If Walter Cronkite was “the most trusted man in America,” then US Rolex Sailor of the Year Stan Honey is the most trusted man in American sailing today, and he has described Harbor Wing technology as “very cool.” Full disclosure: Stan has also been a consultant to Harbor Wing and may still be. So Stan has been on the test boats. He’s seen the deal. He understands. 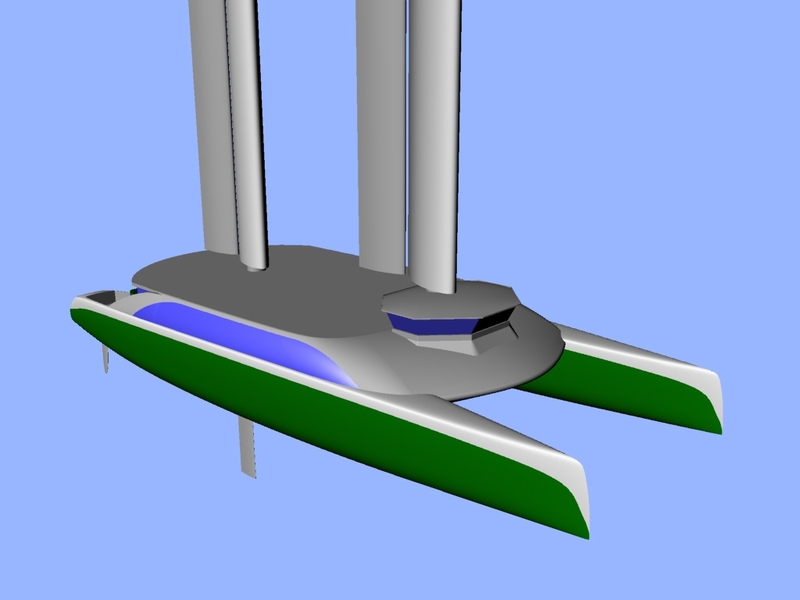 The principals of windwingtech.com, Gardner, Simonson and Korfin, built their first catamaran for AdventureCat.com 18 years ago, themselves. That consumed a lot of time, but I still see that 55-footer out on San Francisco Bay just about every day (330 days a year is the company’s count), along with the 65-footer that came later. You can buy a $30 ticket for one of the twice-daily 90-minute bay cruises or a $50 ticket for a sunset cruise. Operating out of tourist-heavy Pier 39, the Adventure Cats have taken more people sailing on San Francisco Bay than anybody else, period. But maybe, just maybe, it’s only the beginning. Here they are again, leading the fleet into the final day of the Port of Los Angeles Harbor Cup/Cal Maritime Invitational Intercollegiate Regatta, so who’s to say that good fortune won’t favor the California Maritime Academy Keelhaulers this time rather than leaving them … keelhauled? So what if their skipper, John Gray, has been on crutches all weekend and the memory of last year’s collapse against USC remains vivid and painful, they are looking more like winners than anyone right now with a 15-29 lead over their nearest rival, the U.S. Naval Academy, and only two races remaining Sunday. There are no throwouts in the scoring, but Navy has a lot of points to make up. “I would say we’re pretty happy,” Gray said while hobbling onto the dock late Saturday afternoon, his right foot heavily wrapped, after driving the team to three firsts, two seconds and a conservative fifth in six races among the nine-boat fleet. Winds were 6 knots building to 13 from southwest, and Cal Maritime handled it all. At this report the final scoring depended on the outcome of protests—but nobody was protesting Cal Maritime. Hawaii, the Naval Academy and defending champion USC also were vying for podium finishes, but Vallejo’s lead seemed solid. Whatever happens before the jury, Gray’s injury won’t keep him from sailing them, even if he may not be seen standing behind the wheel much. Two races will be run on the final day Sunday, conditions permitting, starting at 11:30 (daylight saving time) on a windward-leeward race course west of the Angels Gate lighthouse outside the L.A. Harbor entrance. The racing may be viewed from Point Fermin Park at the end of Gaffey Street in San Pedro, an extension of the Harbor Freeway. The event is sponsored by the Port of L.A. The Los Angeles Yacht Club is the organizing authority and California Maritime Academy of Vallejo is the inviting school for the West Coast’s only intercollegiate big boat regatta. 1. Cal Maritime, 1-4-2-1-1-1-5-2, 15 points. 3. Univ. of Hawaii, 2-3-6-2-6-8-4-1, 32. 4. Cal State Channel Islands, 7-2-4-7-4-3-2-4, 33. 6. U.S. Coast Guard Academy, 3-8-7-5-DNF-5-7-3, 48. 7. SUNY Maritime Academy, 4-5-5-8-8-5-9-8-8, 52. 8. Maine Maritime Academy, 8-7-8-4-7-7-5-6, 5r2. 9. UC Santa Cruz, 6-9-9-8-8-6-9-7, 63.